My name is Melissa Shubha Smith aka Ganesha. It is my great honor to present this program. the Usui System of REIKI Healing and a member of the REIKI Alliance. I teach traditional REIKI Healing in the Boston, Massachusetts, USA. Kundalini Maha Yoga/Siddha Yoga, and Chanting. and release the energy held in our spiritual, mental, emotional or physical body. teachers, masters, beings, loved ones, and guides on the Etheric Plane. healing past life situations which teaches us lessons in the here and now. length of your body from the sacrum to the crown. events that are lessons and places of growth for us. and growth in this lifetime. 1. short meditation - connection to the collective group irc energetic. where growth and understanding is desired. penetrating and Permeating your Healing Issue. Swirling Matrix of the Cosmos. Let Us visualize the cosmos surrounding our physical body. Let Us visualize the cosmos surrounding our House. Let Us visualize the cosmos surrounding Everyone in the Channel. down the healing power of Spirit. LOVE, JOY, and TRUTH....COME TO US AND FROM US. 3 Concentric Pyramids of Light. These Pyramids of Light Aligned to the 4 Corners of the Universe. activate the entrance and portal to the Halls of Records. in the Name of the God/Goddess/All That Is. Tat Twam Asi. I am THAT. our Planetary Mission and cosmic blueprint. we look for the Great Doorways...to the Library. jot down our question or situation. and knowledge contained on the pages made available for our viewing. A Book...YOUR BOOK....is suddenly in front of you on the table. their information differently...be open to your own inner guidance. no judgment to the quality or legitimacy of your experience. <LadyNada> isn't it difficult to look at the moment of death in a past life? You have spent some time accessing your book in the Great Halls. Hopefully you have jotted a few things/impressions down. the Great Doorway of the Record. 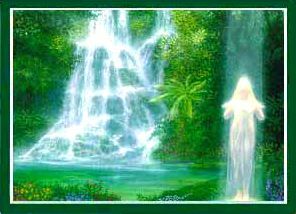 past life situation that corresponds to a present healing situation. Honor the information you have received. We ask the Universal Light Energy to be here NOW! We ask for Healing and Whole Integration of our Past Lives Karmas. We ask for Love-Light-Joy-Truth to penetrate and Permeate our Beings. We will spend a moment in the Healing Light. Be Open. Be Focused. Be Relaxed, Calm, and Strong. Guides for the experiences of the Record today. Now is the Time for Sharing of Our Experiences at the Record. <LadyNada> well I asked for a clue about my neck pain..
<Ganesha> .did you send this issue healing Lady? yellowed watermarked pages and bold letters inked. Learn study, knowledge comes before action. Making music is Gods work, goals are spiritual. <Dove> had impression book was silk/satin, soft & cool to touch. <Sunshine-> my book said "You are an angel"
<Ganesha> sunshine, is this meaningful to you? SHAMAN wonders if it is that easy to access the akashic records! <DoriM> How do we know it is the Akashic records we are accessing? <GANDHARVA> my book cover was made of bright blue steel. <DoriM> what does a blank page mean? you can write whatever you want on it! <DoriM> yes, I never thought of that LadyNada. Thanks!! they called Redemption... in it we went through my book. <Susanrose> you cried whtrose? why???? by the ignorant teachings and guilt of this world? <Grulox> and if others cant? <mud`> how do you forgive yourself? So, I met his soul in a dream and asked his forgiveness.... and he did!! <Susanrose> that is special sunshine! <r3s> Susanrose: have you ever tried not going on faith and just going by yourself? <whtrose> LadyNada: no proof... :) .... just personal experience. it gets me places I could not have gone without it!! the discussion.. maybe I can relate, but I see not a thing..
otherwise you would not have stayed throughout this entire presentation. to help you evolve to your true potential. for their participation and energy tonight. <Susanrose> Thank you for leading Ganesha!! !